Software engineer and political blogger Curtis Yarvin was escorted from Google headquarters by security personnel after his presence triggered an alert, according to information released in James Damore’s class action lawsuit against the company. 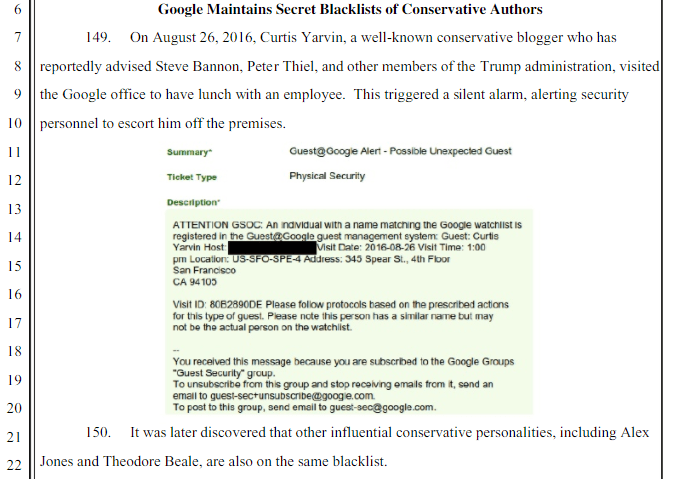 Reportedly, Yarvin was visiting a Google employee for lunch, but his presence at the company’s headquarters triggered a “silent alarm,” culminating in him being escorted from the premises by security. Yarvin is a software engineer known for creating the Urbit computing platform, which is reportedly backed by Peter Thiel. He is also a well-known political theorist; his writings in the early 2000s under the pen-name “Mencius Moldbug” were among the earliest and most influential in the “Neoreactionary” school of thought. In 2016, Yarvin was the target of a failed left-wing campaign to have him banned from a technology conference. The information was released as part of a class action lawsuit against Google, which alleges that conservatives and right-wingers, as well as white males, face discrimination at the company. According to the legal complaint, Yarvin’s presence on campus triggered an alert because he is on a “blacklist” of conservative figures. Other individuals on the list include Theodore Beale, better known by his pen name “Vox Day,” and InfoWars founder Alex Jones. You can follow Allum Bokhari on Twitter, Gab.ai, and add him on Facebook. Email him securely at allumbokhari@protonmail.com.